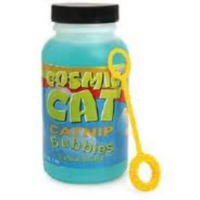 Cosmic Catnip Bubbles are the irresistible play toy for cats. Made of 100% natural catnip oil the catnip filled bubbles are sure to amuse your playful and contented cat. Great fun for the mog and me. Only draw back is that the solution seems quite weak so you don't get more than a couple of bubbles from each "dip". Still pretty good value though.